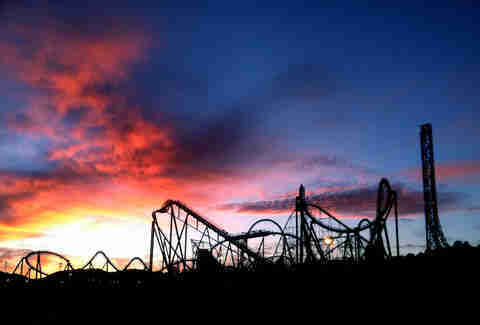 Six Flags is right in your backyard; are you making the most of it? Allow us to be the funnel-cake abusing Virgil of your journey through the water slides and roller coaster rides of the park as we break down the best tips for making the most out of your day. We’ve rounded up the best shortcuts, shortest lines, biggest discounts, and of course, eats you can’t leave without trying (where else will you get a post-coaster wonton taco?). You’ll leave the place like the dancing old guy no one knows what happened to (if you’re reading this, are you ok?). 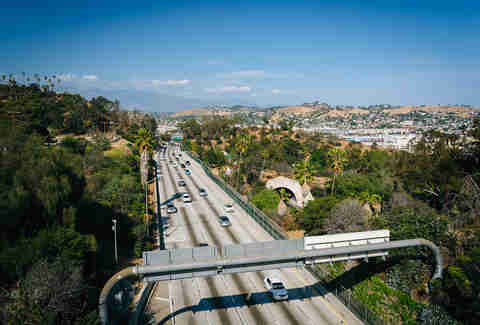 Valencia is way out in the suburban boonies of Los Angeles and really, the only way to get there is by car. Public transit from LA proper will take you hours of confusing bus transfers and the Hollywood tour companies’ tours only give you a few hours of quality time in the park. So get in the car, time your trip around rush-hour traffic, and you’ll be golden. Don’t wait until you get to the gate to buy your ticket -- you’ll end up paying way more. Buy online at least three days in advance and you’ll save about $20 on the admission price. Don’t know when you’re going to go? Buy a single-day summer ticket good for any day in the summer and you’ll still get a sweet discount. 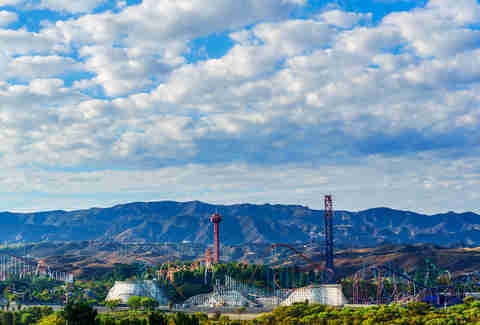 For nearly the same price as a gate ticket, you can get a full season pass, which includes unlimited admission to not just Magic Mountain, but all Six Flags parks (including Hurricane Harbor) for a full year. Upgrade to a gold pass and you get parking and early entry benefits, too. Food is expensive. Food at amusement parks is expensive-er. Your best bet is to buy it all in advance. Enter: Magic Mountain’s annual dining pass, which includes lunch, dinner, and a snack every time you visit for one low price. (There’s lots of grub options at nearly every park eatery, too.) Bon appétit! Rides like Ninja, Goldrusher, and Viper almost never have a substantial line, but don’t let that fool you. These are true old school heroes of the park. 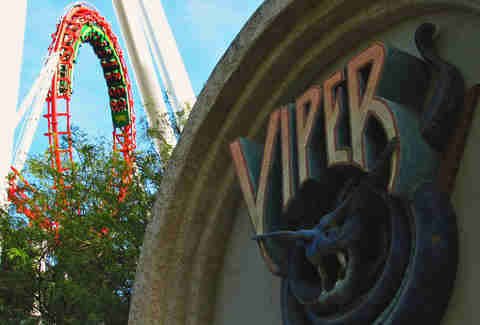 So while everyone else is busy waiting for X2, you can have three rides on Viper, the original corkscrew coaster. Have a Discover card? If so, once a month you’ll have access to popular rides after the park closes. Drive a Honda? If yes, then on Fridays this summer you’ll get to romp the park an hour before opening. Boom. At $700 a year ($500 on discount), the annual fast pass is eight times as expensive as the ticket itself. And what will it get you? Only a few hours of your life back that would have been spent waiting for the park’s most popular rides. Save yourself the cash and follow our other time-saving tips instead. In addition to bags, most rides make you take off your shoes before strapping in, so make sure whatever you wear is easy to slide off and on (flip flops win the day). No one wants to be the jerk holding up the next car because they have to unlace their Doc Martens, you know? The park is much bigger than it looks on the map and walking from one side to the other (not to mention up and over hills) can take up crucial time and energy. 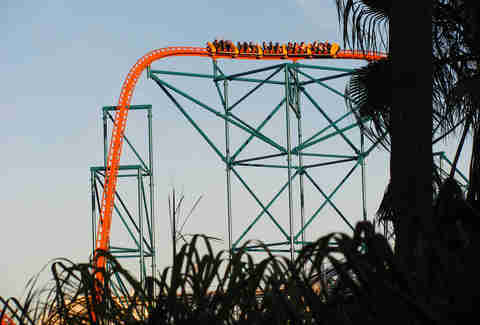 To get to the coaster Tatsu from the entrance, walk into the exit path of Revolution and take the stairs. You can also get to the top of the hill where Ninja is, by hopping on the Helpful Honda Express (formerly the Orient Express). 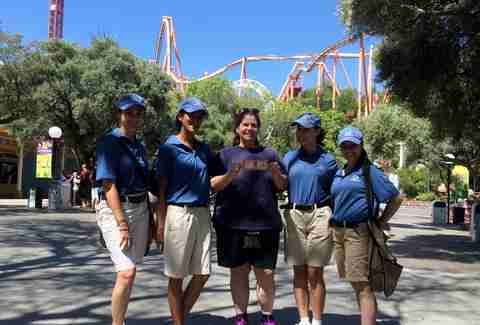 SoCal Honda's not stopping with rail passage though, they're doing Random Acts of Helpfulness at Six Flags all summer, giving early access to all Honda owners and free parking to the first 50. Keep up with it all on Facebook at SocalHondaDealers. 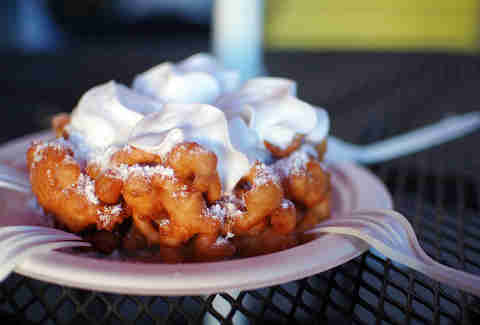 The sweet, doughy, sugary smell from Suzette’s Bakery (now called World Famous Funnel Cake Factory) hooks you as soon as you enter. Give in. Lines there have been known to pile up, especially as the park gets close to closing time. 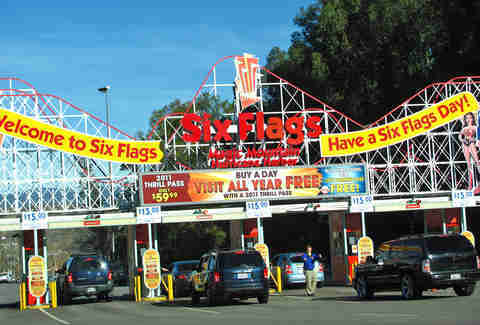 Most of the food at Magic Mountain is good but expected fare: burgers, chicken tenders, sushi, sandwiches, barbecue, etc. But when crafting Chop Six, their Chinese food concept to replace the no-longer existent Panda Express, they created a custom fusion item that is a must-try. Two words: wonton taco. Is it a wonton? Is it a taco? Try one and see for yourself. 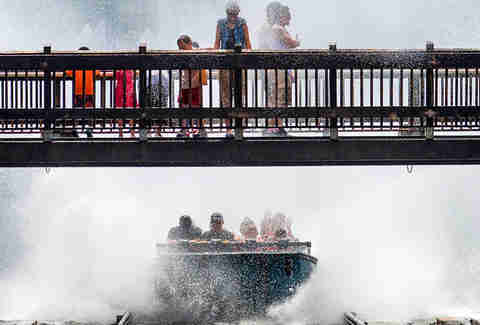 Unlike a lot of “water-themed” rides at other parks, Magic Mountain’s Tidal Wave, Roaring Rapids, and Jet Stream will actually leave you wet -- like do-them-early-so-you-can-dry-off-before-noon wet. Otherwise, you’ll be wearing your clothes like a bathing suit all afternoon. Blech. 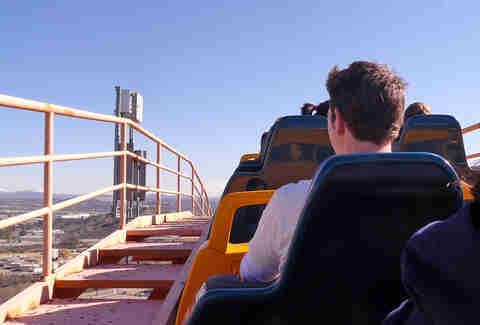 Some people think wooden coasters are all rickety and old and falling apart, but Magic Mountain’s are some of the smoothest (and newest) thrills yet. 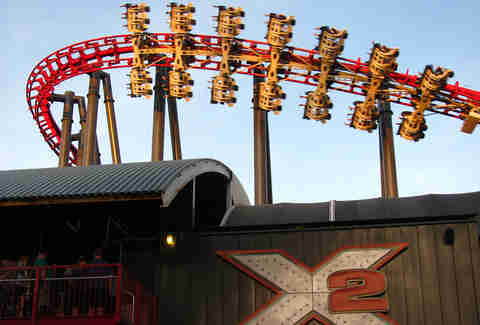 Apocalypse (formerly Terminator Salvation: The Ride) takes you through a post-apocalyptic landscape at over 50mph while the iconic woodie Colossus recently got a serious upgrade with metal reinforcements and new twists and turns. They’re good but no ride is worth a two-hour wait, especially when there are so many other killer (minimally lined) coasters nearby. And unless you get there early, there will be a two-hour line. After a pricey re-do, the once ho-hum Revolution is now a state-of-the-art virtual reality coaster that’s, ahem, revolutionary. Now, one of the country’s first looping roller coaster is an immersive riding experience where you fly around in a fighter jet and shoot lasers at aliens -- you know, just like in real life. If at all possible, avoid weekends, when lines are long and the park is crowded. Instead, go on weekdays -- especially Mondays and Tuesdays -- and you’ll practically have the park to yourself (yes, even in the middle of summer). Lockers aren’t for wussies who can’t carry their own bags -- they’re for people who brought bags and aren’t allowed to take them on any of the rides. Most of the coasters make you leave your stuff in a cubby at the end of the ride. Don’t risk the theft (or a dreaded locker fee) and just keep your things in a super cool fanny pack instead. 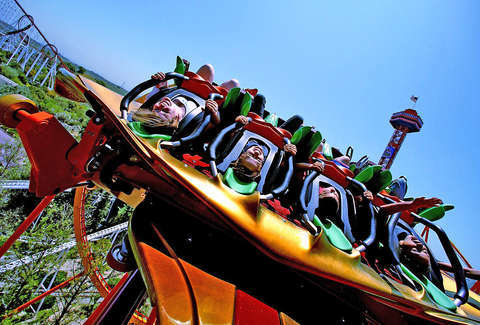 If you’re flying solo, look out for the “single-rider” lanes on Viper, Lex Luther: Drop of Doom, and Riddler's Revenge, which will put you on a seat anywhere on the next available train at a fraction of the regular-line wait time. The single-rider lanes are also a good hack for large parties -- as long as you don’t mind being split up. The Mooseburger Lodge is gone, which might make us more sad if it hadn’t been replaced with Full Throttle Sports Bar. With dozens of flat-screen TVs and sports memorabilia on the walls, Full Throttle is the one real restaurant in the park where you can make a reservation, get table service, and even drink a cold Stone IPA. You’ve been on all the rides, you’ve screamed your entire lungs out, and now the park is closing but you’re not ready to leave town. Avoid the long drive home and crash in Valencia instead. The park has tons of lodging deals at nearby hotels, from the Embassy Suites to the Hilton, where you can take a dip in the pool, order a pay-per-view movie, and give your lungs a good night’s rest.